Journey guitarist Neal Schon is still buzzing about his reunion with former bandmate Steve Perry at the recent Rock And Roll Hall Of Fame induction in New York. Perry joined Schon, Jonathan Cain, Steve Smith, Aynsley Dunbar, Ross Valory and Gregg Rolie at the Barclays Center in New York on April 7 for the honor, marking the singer’s first public appearance with the group in over a decade. “It's really kind of surreal. The whole event was amazing,” Schon tells Rolling Stone. “I really loved seeing Steve Perry, who I haven't seen in a long time, since we did the Hollywood Walk of Fame [in 2005]. I went in his room backstage. I think it was one of the reasons I was so highly emotional. I hadn't seen him in a long time and I realized how tight we always were. While Perry joined Journey for the Rock Hall acceptance speeches, he chose not to perform at the event, with longtime frontman Arnel Pineda rejoining the group for the three-song set that included “Separate Ways (Worlds Apart)”, “Lights” – which they dedicated to Perry – and their signature song, “Don’t Stop Believin’”. 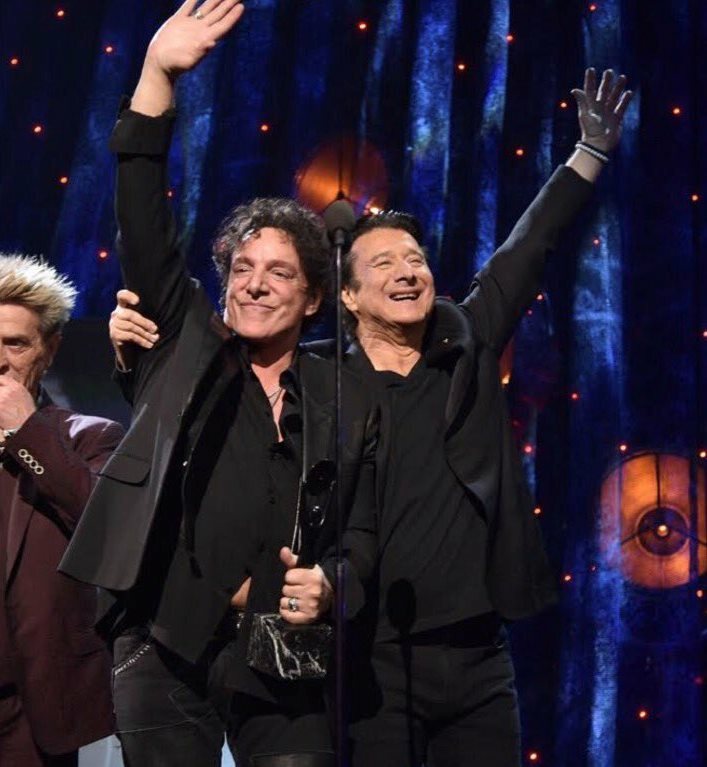 Watch video of Journey’s complete induction and performances here. The 2017 Rock And Roll Hall Of Fame induction ceremony will be broadcast by HBO on April 29 at 8PM ET. Journey will return to The Joint at Hard Rock Hotel & Casino Las Vegas for a nine-show residency entitled “Journey Las Vegas” in May before heading out on a summer US tour with Asia in June.